Are there sharks here? Yes, they live in the ocean. Sharks are found in every ocean in the world. Will we see one while snorkeling at Molokini Crater? I hope so, but it's unlikely. If you see a shark while snorkeling you should consider yourself very lucky. Sharks are a sign of a healthy marine ecosystem. They feed on the weaker and vulnerable fish resulting in a stronger and more resilient fish population (1). One of the more common species of shark at Molokini Crater is the white tipped reef shark. 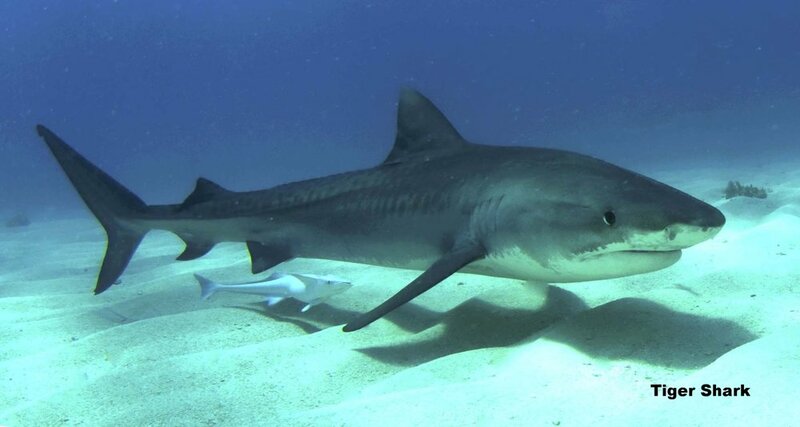 This shark gets its name from the white tip on its dorsal fin and they average 4.5 ft in length. 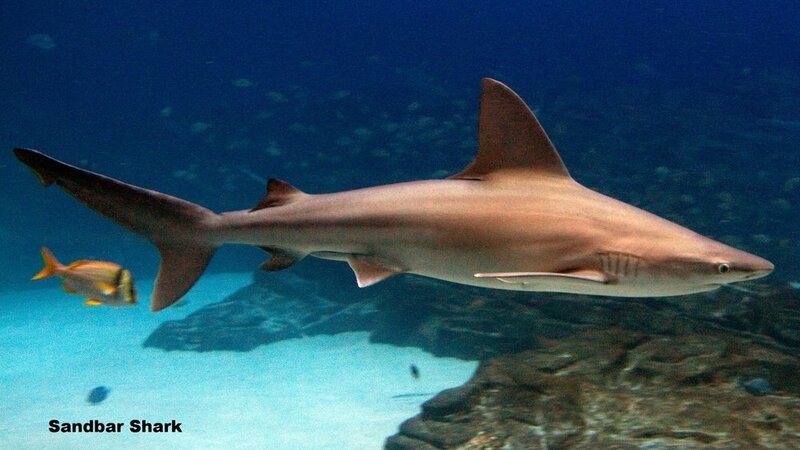 The white tip shark is docile during the day and can be found cruising along the bottom of the reef. ...ranging in size from the smallest, the dwarf lantern shark which can fit in the palm of your hand, up to the whale shark which grows up to 40 ft long (2). Great white sharks are the largest predatory fish, reaching lengths of 20 ft long (2). Great whites are found predominately in temperate waters and sometimes in warm waters. The most notable great white shark populations in the United States are off the coast of California and North Eastern states. Great white sharks have gotten a bad name as being “man-eaters” however, humans are not the preferred prey for the great white shark; they primarily eat seals, sea lions, large bony fish, and cetaceans (3). Occasionally we do get a rare great white shark sighting here in Hawaiian waters. Just last week a local fisherman was out kayaking in about 120 ft of water and saw a great white shark cruising past. The DLNR (Department of Land and Natural Resources) has confirmed eight sightings in the past 60 years in Hawaiian waters (4). Every winter great white sharks travel west of the California/Baja coastline out into the middle of the Pacific Ocean. This gathering spot is an offshore foraging area dubbed the “Shark Cafe” or shared offshore foraging area (SOFA). During this migration, it is possible for great whites to travel out to the Hawaiian Islands. In the summer, most of the sharks return north to California’s central coast. 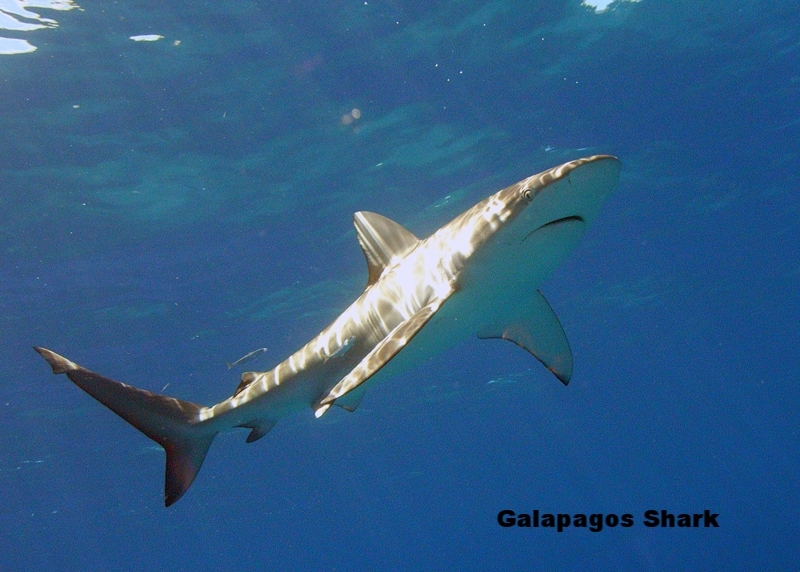 ...that are more regularly seen are the Galapagos shark, blacktip reef shark, gray reef shark, sandbar, and tiger shark. Check out DAR’s website for a list of shark species found in Hawaii. Sharks are prehistoric, highly developed fish that have changed very little over the thousands of years. One of the major concerns about the shark populations of the world is the over fishing of sharks. Shark fin soup is a delicacy in some countries that is served on special occasions. The main ingredient in the soup is just like it sounds: the fins of a shark. Shark finning is where the fins of a shark are removed and kept while the rest of the body is discarded. Many times the shark is alive when the fins are removed and thrown back into the ocean to die a slow agonizing death. The fins of the sharks are traded from the fisherman to the market, then to the consumer. Shark finning and the fin trade are global problems. It is estimated 100 million sharks are killed each year for their fins (5). The world’s top exporters of shark fins in 2010 were Singapore, Taiwan, Indonesia, Spain, Hong Kong, and the United Arab Emirates (6). Shark fins are a highly sought after, expensive item and people are willing to go to great lengths to get them. This demand has put tremendous pressure on shark populations worldwide and has lead to a catastrophic decline in shark numbers, threatening many species with extinction. The act of shark finning is for the most part unregulated and unreported, resulting in an industry where numbers are fudged and endangered species are killed. There are multiple ways this destruction can be stopped, such as: trade bans, restrictions, finning bans and by simple raising awareness about the issue. We love our sharks here in Hawaiian waters and we always look forward to seeing them on our snorkel tours. Guests should feel lucky to be able to see such a wonderful creature while here on their trip. If you see a shark while in the water, stay calm, and smile because you know you are snorkeling in a healthy ecosystem. For filmmaker Rob Stewart, exploring sharks began as an underwater adventure. What it turned into was a beautiful and dangerous life journey into the balance of life on earth. Driven by passion fed from a lifelong fascination with sharks, Stewart debunks historical stereotypes and media depictions of sharks as bloodthirsty, man-eating monsters and reveals the reality of sharks as pillars in the evolution of the seas. 3) Hile, Jennifer (23 January 2004). “Great White Shark Attacks: Defanging the Myths”. Marine Biology. National Geographic. Retrieved 15 March 2017.